Daniela Buson serves as Assistant Artistic Director for the Tulsa Ballet, following a distinguished career as a Principal Dancer and Principal Guest Artist in some of the most renowned ballet companies in the world. A native of Palermo, Italy, she received her training from Maestro Jacques Beltrame. Upon graduation, she joined Maggio Danza in Florence under the direction of Evgeny Polyakov. 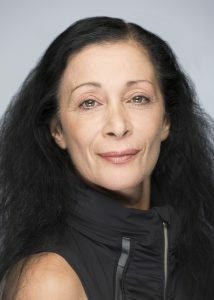 In 1983 she joined the Deutsche Oper Berlin in Berlin, Germany, as a Soloist and a year later moving to the Northern Ballet Theater as a Principal Dancer. During her career as a Principal Dancer and a Principal Guest Artist, she appeared with companies such as the Northern Ballet Theater and English National Ballet in England, Basel Ballet in Switzerland, Les Grands Ballet Canadiens in Montreal, Canada, Cincinnati Ballet, Ballet West and Ballet Arizona in the US, the Teatro Massimo in Palermo, Italy, and Tulsa Ballet. She danced leading or title roles in most of the classical ballet repertory including Giselle, Don Quixote, La Sylphide, The Sleeping Beauty, Michael Smuin’s Romeo & Juliet, Val Caniparoli’s Lady of the Camellias, John Cranko’s Taming of the Shrew and Ben Stevenson’s Cinderella among others. She was also featured in works by George Balanchine, Jerome Robbins, Sir Kenneth MacMillan, Nacho Duato, Birgit Cullberg, James Kudelka, Val Caniparoli, Paul Taylor, Christopher Wheeldon, Antony Tudor, Stanton Welch and many other masters of the 20th century. She has won numerous awards for her dancing including the Leonide Massine Positano Prize. Upon retiring from the stage, she became Ballet Mistress with Tulsa Ballet. In her private life she is married to Tulsa Ballet’s Artistic Director Marcello Angelini with whom she has twin boys, Alessandro and Valentino.